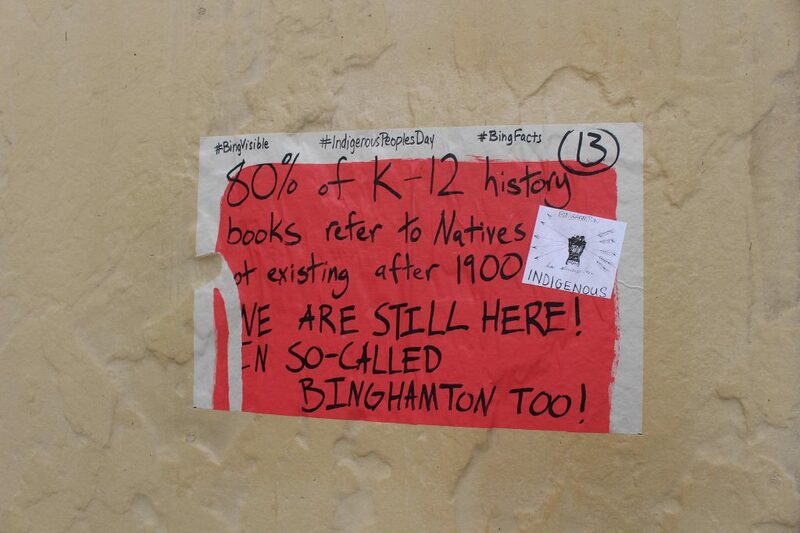 This past Oct. 8, the city of Binghamton celebrated its annual Columbus Day Parade. This event was filled with varieties of food and included a marching band. Some are appalled by the way we still celebrate Columbus Day, while others do not see genocide when they are celebrating an annual city tradition. Before Columbus set sail in 1492 to what would later be considered the “new land,” there existed hundreds of native tribes and empires all throughout the Western Hemisphere. As children, we grew up with the holiday of Columbus Day and didn’t question it much. A day off of school for the celebration of the person teachers made us believe was an international hero seemed like a great excuse to miss class. Although we learned that native tribes occupied the lands, textbooks and our past curricula praise Columbus due to his “heroic” actions. I personally was taught in elementary school to look at Columbus as a figure in history who benefited mankind. He was, in fact, beneficial, but only if one is looking at history through the eyes of a European. Today, we are finally moving away from Columbus Day to Indigenous Peoples Day and some are still trying to get used to this switch. So what is Indigenous Peoples Day? Indigenous Peoples Day recognizes the culture and influence that Native Americans, who were the first to inhabit this continent, have had on the Americas. This holiday originated in the early 1990s, and Mayor Loni Hancock of Berkeley, California, aimed to make Berkeley the first city to formally recognize the culture of Native Americans on a day that has been centralized on European colonial accolades. Soon after, other cities and states followed, with Santa Cruz adopting this holiday in 1994 and Seattle in 2014. During recent years, the number of states and cities that have been celebrating this holiday and the achievement of Native Americans has risen dramatically. Will Columbus continue to be idolized? Many cities and towns throughout the Americas have erected statues recognizing Columbus and other European explorers who arrived to a land only to pillage the soil and its peoples. Columbus is most often placed as a statue or monument because many believed he was the first to discover the Americas. As a matter of fact, Leif Erikson, who was a Norse explorer, along with the Vikings actually landed in the “New World” centuries before Columbus. Regardless, famous monuments such as Columbus Circle have been attracting a lot of controversy in the past decade. Many believe his “idol” image should be destroyed, while others want to keep this part of history in place. Although it is a controversial topic, there are arguments supporting both sides. Native American heroes, which include but are not limited to Chief Pontiac, Geronimo and Chief Victorio, are historical figures that should receive more recognition. Society today should put an emphasis on these names along with other accomplished Native Americans in order to showcase and shine a light on a rich and hidden culture. Latin American countries that also have a rich Native American history are also beginning to recognize the importance tribes and empires have had on the land in today’s society. So why celebrate Indigenous Peoples Day? Columbus is most notably recognized for discovering the Americas, which is false. We are also taught that he established a friendly relationship with the natives of the area. Now, it is clear that Columbus colonized an area with native inhabitants and stripped them of their culture, resources and land throughout the centuries. In addition, this holiday perpetuates the idea that Native Americans existed centuries ago and do not exist today. Although they are a minority in this country today, Native Americans still continue to celebrate their culture and make up a vital part of American history and our society today. Even though many cities have established this holiday, that does not mean that they abolished Columbus Day. Recognizing this holiday brings attention to the genocide of one of the original inhabitants of this continent. This not only helps us understand and connect with the dark side of American history, but understanding our past allows us to learn for the future.